Bobby is a male Plum-headed parakeet. The Plum-headed female has a gray head and the male's head is grayish purple or plum colored... thus the name Plum-headed! The Plum-headed Parakeet is a very beautiful bird. They are a very tolerant towards other parakeets, and even known to be peaceful with small birds such as finches. Description: The Plum-headed Parakeet belongs in the Psittacula genus, that are known as Ringneck Parakeets. This genus has the distinguishing characteristic of a colored collar going around the head in the males, or a pronounced stripe running through the chin area. The Plum-headed Parakeet male has a plum colored head with a narrow, black collar around it's neck followed by a bluish-green band. They have dark green wings and a reddish brown stripe on the lesser coverlets, and the rest of the body is light green. The central tail feathers are bluish-green and the outer tail feathers are green with light yellow tips. The female's head is lighter than the male, and they have no red shoulder marking. The young reach their adult plumage after 2 years and the second full molt. These birds grow to a length of 13" (33 cm). Distribution: The Plum-headed Parakeet is found in Sri Lanka, Ceylon, most of India, west Pakistan, Nepal and the Rameswaram Island. In the wild, Plum-headed Parakeets eat a variety of seeds, fruits, nuts, blossoms, leaf buds. In addition to these foods, you can offer them vegetables and commercial pellets. They like nuts with the shells cracked, such as walnuts, pecans and almonds. They also enjoy the same nutritional foods humans eat, including cooked chicken. Cooked beans, rice, and grains are also enjoyed, but soft foods like these will spoil in about 4 hours. An occasional millet spray is a nice treat. Housing: A a roomy cage is required, and these birds are sensitive to freezing temperatures. Social Behaviors: In the wild, these birds live in flocks and are very social. They have a pleasant nature and tolerate other birds housed with them except when breeding, then like many parakeets, they can be more aggressive. Handling/Training: See About Parakeets: Handling and Training for detailed information. Activities: Parakeets are very energetic birds! Besides flying, which is important for all parakeets, these birds love to chew! Be sure you provide them with lots of assorted toys and wood chews, perches and swings. According to author Annette Wolter, in her book "Long-Tailed Parakeets", Plum-headed Parakeets do not bond with a mate for life, unlike many parakeets. She states, "...they do not form lasting bonds with a mate. After brooding, the pairs separate once more." However, she does state that they are easily bred. They are not always successful at raising their young, so you may have to hand-rear the babies. Each pair will need two nesting boxes to choose from. Once the nest box is selected the female will lay four to six eggs. Potential Problems: These parakeets call varies from melodic notes to a shrill call when in flight. They can have a loud scream. Availability: Plum-headed Parakeets are available from time to time at pet stores or from breeders. I m interested in birds. And plum headed parakeet. Hi I have Plum-headed Parakeet for sale please contact me at sumeet_kpoor8@yahoo.com. PLEASE LET ME KNOW MORE ABOUT THE PLUM HEADED ,AND PRISE? Hello. I am interested to purchase the plum headed parakeet. Can you please give me the details of the rate and place and also age of the birds. 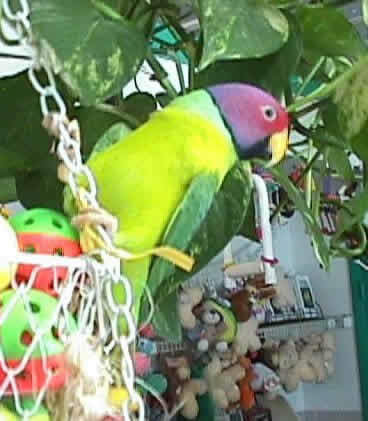 Hi Sumeet, i am interested in buying a male plum headed parakeet who is hand fed and tame, please let me know the price..